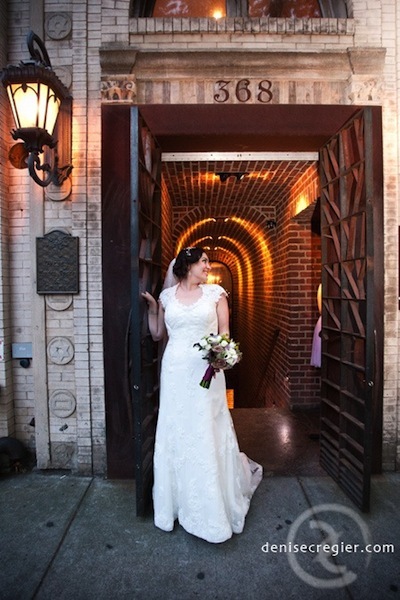 After getting ready at the Nu Hotel, the wedding party and family took to the streets of Brooklyn Heights along the brownstones and little shops which made for some really fun photos. At Deity NYC, they exchanged vows and celebrated with a very sophisticated reception. Congrats! My husband and I were married at Deity on September 7, 2013, and I have Deity’s owners and staff to thank for giving us the best night of our lives! Deity is a “very Brooklyn” building located on Atlantic Avenue that was initially constructed as a synagogue around the turn of the century and is now an event space (i.e., all they do are weddings and parties). Each of it’s three floors has a very different feel — the upstairs loft space where we had our ceremony and dinner has exposed brick, hardwood floors and string lights; the cocktail lounge where we did our cocktail hour and cake cutting has stained glass windows and a giant tree growing in the middle of the room; and the basement dance floor area is perfect. 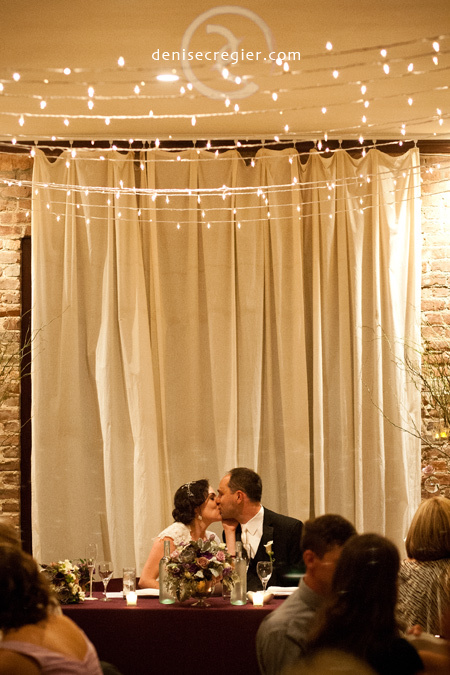 Deity is an amazing value — priced substantially lower than many other Brooklyn venues. The owners/managers are a husband and wife, and they were incredibly friendly, helpful, and responsive throughout the whole process — we rarely had to wait more than 24 hours for an email response, which is important especially when things are down to the wire. They provide all the catering, tables, alcohol, staff, menu cards, even the DJ (for only $500 additional fee) — this was really important with us as we wanted to do as much “in house” as possible. That said, they regularly work with vendors and the set up of our flowers and cake went flawlessly, as did our ceremony musicians and the cocktail hour band. These guys are consummate professionals — our wedding was seamless. The food was wonderful — they serve it either family style or buffet, and we went with family style. It was delicious, as were our signature cocktails. The only thing that might be an issue for some couples (not us) was that you cannot do a tasting prior to your event. We trusted that the food would be great, and it was — but if it’s really important for you to try the food first, that could be an issue.